"These are the things I was going to put into a boot no matter how long it took. I spent over a year working on some pretty crazy concoctions and just wasn’t satisfied until the current Belmont boot came to be. The Option 2 strap was added to keep your heel locked down when cinched. You don’t want to know what option 1 was. I also designed a footpad that takes the abuse my body is used to. Goodbye Mr. Heelbruise, we won’t be missing you." New pro footpad for greater leverage into the wake, super soft landings and additional traction. 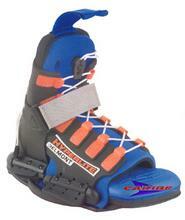 These are extremely comfortable bindings, and they're pretty cool looking as well. I have some slight difficulties getting into and out of them, but I think that's just me and you shouldn't think less of them because of that. The Belmonts have excellent support, and not once have my feet popped out on a hard fall.